A durable rock material that needs to be cleaned and maintained with care. This guide is about cleaning marble. I am in need of help with cleaning Marble end tables that I just got back into this house after 35 years. The End tables were given to a family member years ago and now that I have them back she has painted the table and the tan marble with Brown ugly paint. I got most of the paint off of the marble but there is still some in the small pits of the grain. I would like to know how to clean these really well and also what will make them shine again like they once did. This is not white marble it is Tan marble. Each table top weighs about 25-30 lbs I know this can be done to make them shine again, all help will be tried. Clean marble with pulverized chalk. Apply with a damp sponge. Use and "Impregnator"; check at stores that sell marble tops or slabs. This will give it the luster you are looking for. I have a marble fire place and over time people have put tea cups on it, and it has become stained. Has anyone an idea on how I can remove these stains and get a shine back to it? I have heard that you can make a paste with baking soda, you may have to try a couple times, also toothpaste the white past type, you can use furniture bees wax or Turtle Wax (for cars) to put shine on. I knew someone with a marble kitchen floor (big mistake) and she would have a professional company out several times per year to refinish it. Said she'd never do it again because it's not convenient to maintain. I have marble in my bathroom and I'm not sure how to clean it. Any tips? Marble has a delicate surface. Clean surfaces with mild detergent or stone soap· Thoroughly rinse with clean water and dry the surface after washing. Blot up spills immediately, if possible. Protect countertop surfaces with coasters, trivets or placemats. DON'T use vinegar, lemon juice or other cleaners containing acids on marble. Don't use cleaners that contain acid such as bathroom cleaners, grout cleaners or tub & tile cleaners. Don't use abrasive cleaners such as Comet or soft cleansers. Just using mild soap and water is your best bet. My garden marble table is very dull. Is there a liquid that will make it shiner? If its real bad, you sand it down with a power sander, but have to use the sand paper for marble, then you buff it back with marble buffing compound. If its not that bad, they make cleaners for marble that Walmart carries. Do NOT use anything like vinegar or limeaway on it. It will ruin it to the point it will have to be sanded. How do I remove little dark spots on marble? Marble floors? Using clean warm water is the best. No harm chemicals. If you must use a real cleaner, use the mildest as possible. 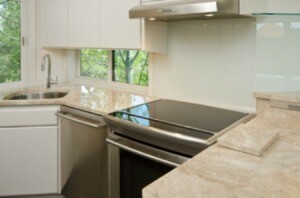 To clean marble and travertine, use Dawn liquid dish-washing detergent as a general cleaner. To remove stains, make a paste of 1 Tbsp. cornstarch and 1 tsp. of 3% hydrogen peroxide. Cover the stain and allow paste sit for about an hour. Remove the dried paste, rinse with clear water and buff dry. To make marble and travertine shine, buff with dry cornstarch and a soft, clean cloth. Never use products like Lime Away, ammonia, lemon juice, vinegar, bleach, or Windex on these surfaces as they will dull their shine over time. Anything acidic, like Lime Away, vinegar, lemon juice, will dissolve the marble, not quickly, mind you, but over time. This is why it dulls the shine. My parents have a marble bathroom counter, that we can not get clean, with out seeming to damage the marble surface. Any ideas would be great! I have marble and granite floors in my foyer. I am looking for a homemade cleaning solution. Does anyone know what to use? Also, what about cleaning travertine? I use Stonecare products. I have also tried clorox wipes for kitchen. The problem is that it looses its luster and eventually can fade the granite, so I went back to Stonecare. Its 8.45 per quart, when purchased by the gallon. YOU spent the money getting granite, why not keep it beautiful? It will tell you what you need to know. I have a white marble table top and it has both stains from food and marks from coffee cups and place mats. How do I remove them? Also, I need to know a safe inexpensive way to polish the marble. I am looking for advice on how to clean an old old marble washstand. Can anyone give me advice on cleaning marble? I am contracted to clean Italian marble floors before sealing, any suggestions?